Just like getting your heart rate to a certain target area for recovery, proper nutrition and hydration play a key role in exercise. Your body performs better when it is well hydrated and fueled. It will also stimulate muscle protein synthesis, improve recovery and enhance performance during your next workout. Restore fluid and electrolytes (sodium and potassium) lost in sweat; weigh before and after exercise and replenish what was lost. One pound of fluid lost should be replenished with 16-20 oz. of water. Replace muscle fuel (carbohydrate) utilized during exercise. Provide protein to aid in repair of damaged muscle tissue and to stimulate development of new tissue. Begin nutrition recovery with a snack or meal within 15-60 minutes following practice or training session. Individual needs will vary, however, the appropriate ratio of carbs to protein is 2-3:1. It’s best to get your body hydrated before you even think about heading to the gym. One way to determine your overall hydration status is to check out the color of your urine first thing in the morning. According to the Academy of Nutrition and Dietetics, lemonade-colored urine is a sign of appropriate hydration, while dark colored urine (think apple juice), indicates a deficit in H20. You need to eat after a workout. Period. For one, it’s important to replenish the glycogen that has been depleted during your exercise. Secondly, eating protein after a workout is a must for a speedy muscle recovery (particularly after weight training). Post workout ratio of carbs and protein is 2-3:1 (carbs to protein). I usually do 40 grams of carbs to 20 grams of protein. Everyone is slightly different. Nutrition plays such a large role in our health. 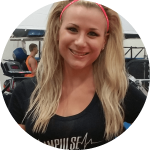 If you have questions about your nutrition habits, call us at 330-499-2266 to get set up with a free 15 minute consultation with Courtney!